The second year of blogging has not been a continuous writing affair… though there was no end to cooking affair! Too much into packing, shifting places, entering new places and faces, unpacking and settling has been quite tedious. When I look back, the previous year has been a slow-paced one… sometimes out of sight for a couple of months too. But I feel overwhelmed by the support I have received in spite of those long intervals. NANRI – Thanks a ton – for understanding my absence for short periods! During this period of settling down, the new subscribers that joined hands with me and my old friends who have been continuously keeping pace with my posts, have made me feel more guilty of not having settled sooner and not having posted more. I shall surely try to compensate on that this year. As usual, let’s enter another year with a sweet dish. This is one of my favourite payasams, of course next to Adai Pradhaman (https://dosaikal.com/adai-pradhaman-ada-pradhaman).J aggery and coconut milk make a sweet dish heavenly! This is one such payasam/pudding/kheer, with dehusked green gram. Generally, in payasams or any sweet dish, nuts are roasted or fried in nei/ghee to add richness and flavour. Here, traditionally, thinly cubed coconut pieces are fried in nei/clarified butter and added to the completed payasam. The coconut pieces can be added with fried cashewnuts. But, they can taste good all alone without the nuts too! Here, I have avoided the nuts and added fried coconut pieces alone. I have seen aachi and amma always use chukku podi – dry ginger powder when jaggery is used in sweets. 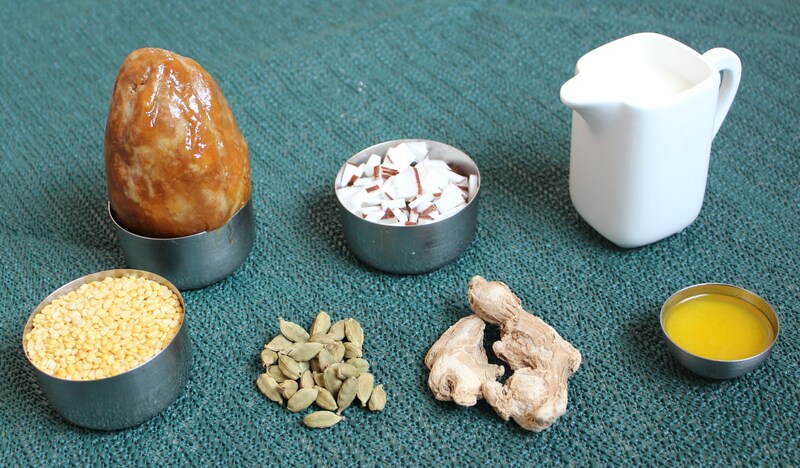 Adding dry ginger to jaggery helps in avoiding acidity and gastric problems. When the dish has coconut milk to make it a heavy intake, chukku podi/dry ginger powder would aid in easy digestion too! 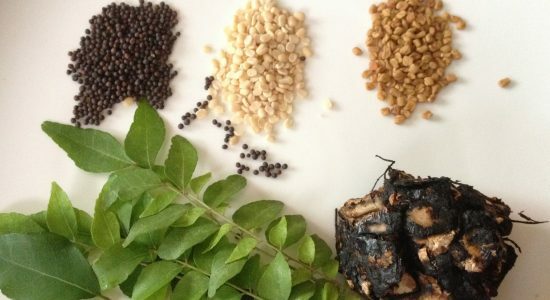 Do not roast the lentil too dark as the payasam would lose perfect colour. Coconut pieces should be really thin. Keep track of the amount of water in cooking the lentil and soaking jaggery… too much water would result in too much cooking time in reducing the lentil-jaggery mixture before adding coconut milk. The most important thing is the coconut milk. Adequate care should be taken not to curdle the milk. REHEATING: Do not reheat the payasam directly on stove as it may curdle or the lentil would get burnt at the bottom. Heat slightly in microwave or Boil water in a vessel and place a steel bowl of payasam to heat up. This is not as complicated as the points mentioned above! But actually, just take care of the coconut milk alone. If one notices, I have emphasised a bit too much on water. It is just to say that one need not panic if lentil has less water or more water. Add more water wherever needed and incase of excess water, boil it to bring to required consistency. Just one thing to remember, all alterations of boiling should be before coconut milk is added. If lentil is overcooked, not to worry. 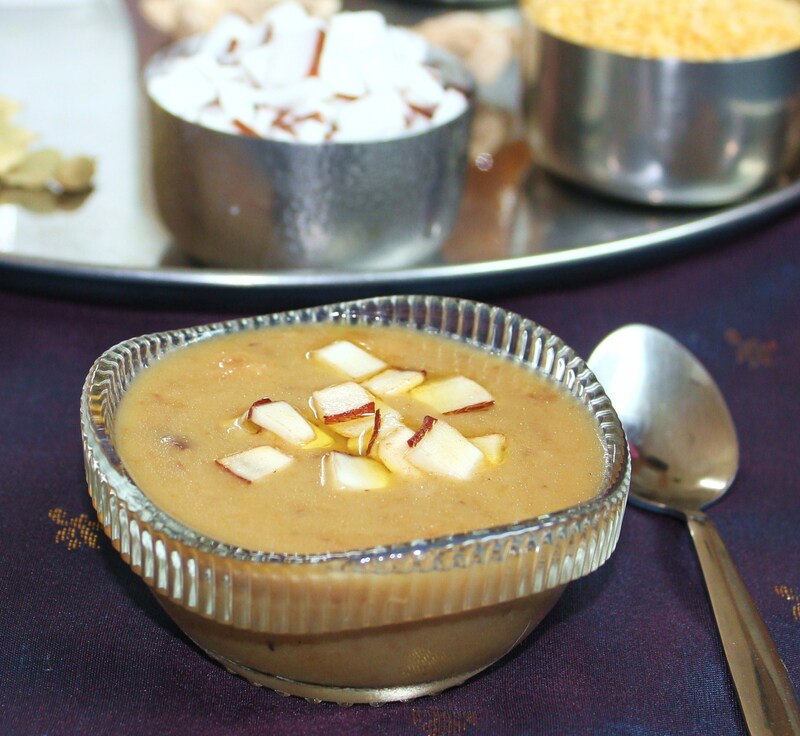 This payasam tastes good with overcooked lentil too! Personally to me, doesn’t make big difference. The taste of coconut milk with jaggery takes care of everything. Forgot to reduce water before adding coconut milk…… not to worry again! Instead of a bowl, serve in a tumbler/glass as we do at home in Tamilnadu!! How time flies past Subbu – I am so glad you started this blog. And don’t worry about not being able to keep to a schedule – you being happy and at peace is MOST important. Stay well and continue to share the gorgeous flavours from grandma’s kitchen! Thanks so much Oz. You are right… writing on food makes me so happy and the experience is just out of the world!